Let us reconsider the full historical context of the University of California’s founding moment and the context in which it coined its motto, “Fiat Lux.” A brief reflection on the UC’s political, geographic, and historical conditions of possibility may offer some vital complexity and depth to recent college- and university-based discourses on free speech and academic freedom, while raising deeper questions about the notions of “speech” and “freedom” in-and-of-themselves. 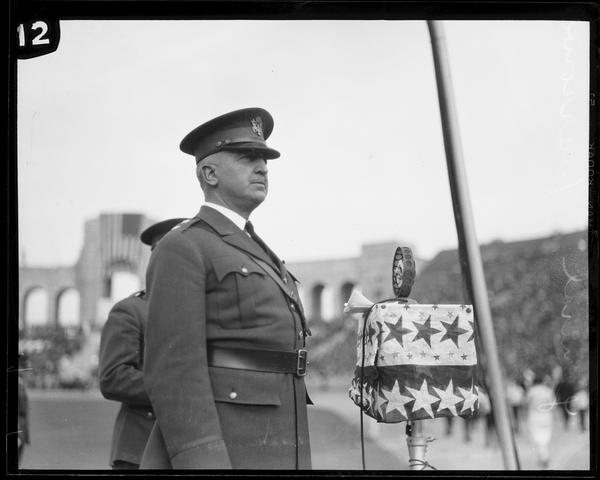 The founding of the University of California represents a particular confrontation between Western Euroamerican modernity and the high point of Manifest Destiny—a nation-building cultural, political, and military regime that is inseparable from the UC’s academic and juridical infrastructure. During this extended period, the UC’s founding faculty and administrators were engaged in a variety of global colonial projects, which is to say racial colonial projects, including the US conquest and protracted colonial governance of the Philippines. As a Ph.D. student at UC Berkeley, i spent a lot of time in a building named after David Barrows, President of the University of California from 1919-1923. Barrows had an interest in California Indians, particularly the Cahuilla Tribe, the topic of his Ph.D. dissertation at the University of Chicago (where else?). Before he became the UC president, Barrows played a pivotal role in the US colonization of the Philippines, during which the US military was engaged in a genocidal military campaign to liquidate and neutralize indigenous resistance to colonial occupation throughout the archipelago. As people and ecologies were destroyed, burned, and displaced, Barrows accepted an appointment as Chief of the “Bureau of Non-Christian Tribes of the Philippine Islands.” I imagine that if he were awakened from his mortal slumber, President Barrows might concede that the conditions of his own “academic freedom,” of his freedom to speak and his “freedom of speech,” were not only entangled in but constituted by his lifelong engagements with projects of colonial dominance, from the Cahuilla to the “non-Christian” Philippine tribes. “Fiat Lux” indeed. Across these and other historical political geographies of racial-colonial dominance, modern law, rights, and disciplinary academic knowledges affirm white life’s ascendancy over all other life. This has been the historical, if generally tacit mission statement of the modern university, including the University of California. War against other life, culture, ecology, and sociality is the genesis of law, rights, and university epistemologies in this instance, structuring the “civility” and the “freedom” that disciplines those who are on the historical margins of that civil society, the underside of the thing called Civilization. In this sense, it is horrifically appropriate that so many of us engaged in the counter-knowledge productions of critical ethnic studies, queer studies, gender and feminist studies, and decolonial studies have encountered David Barrows’ bronze bust in that building at UC Berkeley. His visage reminds us that the intellectual space and infrastructure to engage in such counter-knowledge production is the outcome of intense, rigorous, collective social movement that critically extends the entitlements of academic freedom while confronting the ways in which the institutional stability constructed around the edifices of academic freedom is actively policed. Allow me to turn to the fact of policing in the second half of my reflections on this 150th anniversary. A spectacle of police violence at UC Davis on November 18, 2011 catalyzed a national and international response, fixated on the vulnerable bodies of young white people engaged in an act of civil disobedience. (With all due respect to the people of color who were also in the line of fire at Davis, my contention is that their bodies were not the ones with which the national and international response was primarily concerned, nor was their vulnerability centrally responsible for inciting this global outrage in the first place.) 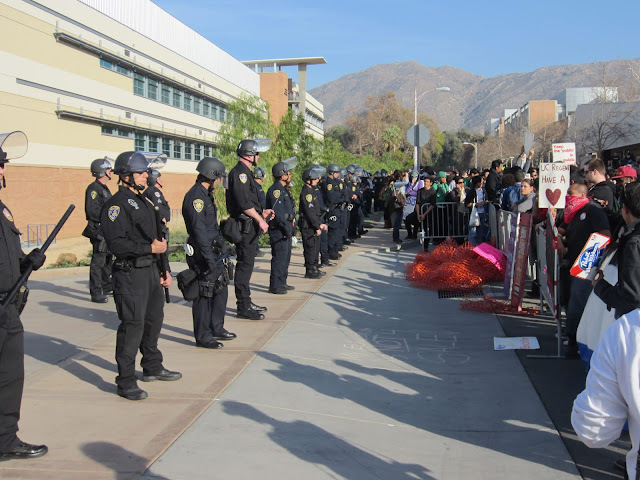 Largely displaced by the righteous outcry over the UC Davis police’s pepper spraying of students in November 2011 was a more massive and militarized display of police force/violence that occurred at my home campus of UC Riverside two months later, on January 19, 2012. On this day, UCR students were shot with “less than lethal” police pellets during protests of tuition/fee increases at a meeting of the UC Regents. (Here i will gently suggest that we modify our language to acknowledge that these actions might be more comprehensively described as “debt protests.”) In anticipation of this student-led demonstration, police were mobilized from every UC campus other than Davis and Merced, supplemented by officers from the City of Riverside Police Department and the Riverside County Sheriff’s Department. Police helicopters periodically circled over the protest, while officers appeared to assume sniper positions at strategic high points on several campus buildings. The climate was thick with police presence, and the pageantry of political intimidation represented a massive show of force against the students, faculty, staff, and ordinary people who populated the crowd. This police presence starkly contrasted with the protest’s well-disciplined adherence to tactics of “nonviolence.” (By way of definition, i do not consider loud chants, intense and vitriolic rhetorics of protest, militant refusal to disperse an alleged “unlawful assembly” or sit-down blockades to constitute “violence”; further, even if one wishes to perform the academic gymnastics of labeling such activities as forms of discursive, symbolic, existential, and/or immanent violence, they are not of a kind remotely comparable to the aforementioned marshaling of legitimated state violence.) For reasons i have explained elsewhere, we should not be surprised that UC Riverside’s scene of police repression—images of which were easily accessible via e-mail listservs, public YouTube videos, Facebook photos, and the like—did not attract remotely the kind of attention and righteous reaction as did the incident at UC Davis. There is something structurally white supremacist about how expressions of outrage and institutional shaming over the UC Davis police spectacle seemed to be fueled by an overidentification with (historically white) university campuses as places of presumed innocence, wherein enrolled and employed (white) bodies are presumed to presume innocence. On the other hand, UC Riverside students generally signify (and biographically reflect) the normalized policing and criminalization of Black, Native, and Brown people—young and old, urban and rural, transgender, queer, and straight. Such bodies—such people—are incapable of extracting the consensus of liberal outrage surrounding (and ultimately protecting) the repressive university policing of white, able-bodied college youth. Thus, while all campus policing is fundamentally “political,” only a select few of its most acute forms are addressed as such. How are these notions of liberty (particularly as they are inseparable from the jurisprudential regime that produces them as such) structured in relations of gender, race, sexual, and colonial dominance in the long historical and recurrent-present tense? How are free speech and academic freedom actually inhabited by people whose speech and thought are constituted in relations of dominance, such that the underlying humanist allegation at the core of both terms is (perhaps radically) demystified and disrupted? What forms of policing are martialed through the politics of free speech and academic freedom?